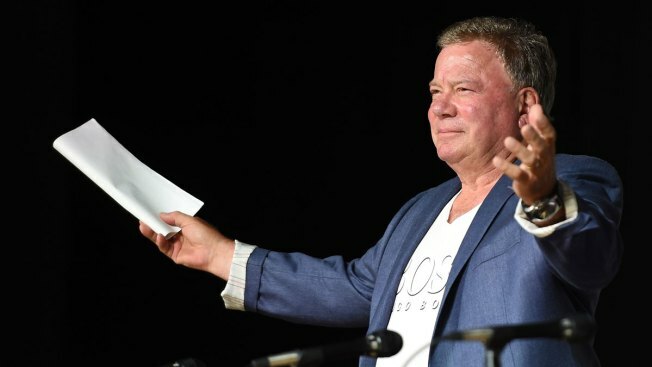 Actor William Shatner speaks onstage at "The Autobiography of James T. Kirk" at the San Diego Convention Center on July 9, 2015 in California. As "Star Trek II: The Wrath of Khan" marks its 35th anniversary with a return to theaters for special screenings next week, star William Shatner is celebrating more than his long history as Captain Kirk. At 86, the stalwart entertainer is busier than ever, starring in a reality series, competing as an equestrian, traveling with his one-man, writing books (his latest is on aging), making movies (including one he wrote) and launching a Twitter campaign to encourage charity and kindness that he calls the Ubuntu Project, referencing the South African concept of common humanity. "Khan" — which Fathom Entertainment plans to screen at 600 theaters across the country on Sunday and Wednesday — stands out because "all my friends were in it," says Shatner, who talked with The Associated Press about that film and his other creative endeavors. Responses have been edited for clarity and brevity. AP: How much does "Wrath of Khan" stand out in your career? Shatner: Well it was a lovely film. I enjoyed doing it. All my friends were in it. It's been a long time. The actors, many of them are now no longer with us, and yet the film stands. AP: Are you surprised the film still has such life? Shatner: It's stupefying, really, that people still want to see it. And it's very popular. AP: You released a book earlier this year about horses. How much time do you spend riding? Shatner: I've just come back from world championship horse show, where I competed. My wife did, too. We're going away next week to another type of horse show in Las Vegas... Now I'm just finishing up a book on aging... That will be out next year, next spring or winter. AP: You seem to see the sunny side of your fans on Twitter. How do you manage that? Shatner: I'll give you one example: A man from a small town, Nanaimo on Vancouver Island, tweets that his son who's autistic will only eat pasta from a carton that has Star Wars stuff on it, but they've run out of the cartons in Nanaimo and can anybody help him. I retweeted that saying, "Let's help this man," and he received thousands of cartons from elsewhere of the food. Plus the Kraft company called and said to the young man, "We want your help in designing a new carton." That singular thing, who knows what affect that will have on an autistic kid? And the kindness of everybody to react to that man will change everybody's character for their lifetime. Multiply that by many, many instances of people seeking help and getting help from being on Twitter... I'm calling it the Ubuntu Project and I want you to feel your humanity by giving something — it could be innocuous, it may be nothing to give $10, but you're exercising your ubuntu. AP: You've embraced comedic roles later in your career. How intentional was that shift? Shatner: When I started out in theater in Canada — I had about five years as a professional actor before I came down to the states — I did only light comedy... Then got into serious roles, and my ability to play comedy was shunned to the side there for a while, but I've always thought that the character I'm playing should have a sense of humor about something. Deadly serious is deadly in my opinion. AP: You also showed a funnier side in "Better Late Than Never," the reality series you did last year with Henry Winkler, George Foreman and Terry Bradshaw. Shatner: I just came back from six weeks of doing next season. It'll be on in January, I think. (NBC hasn't announced a premiere date.) We went to Europe! We had a lot of fun. A lot of funny things happened. AP: You're starting another film soon. What can you say about it? Shatner: It's called "Relic." I wrote the story and a friend of mine wrote the screenplay and we're going to make it in November.